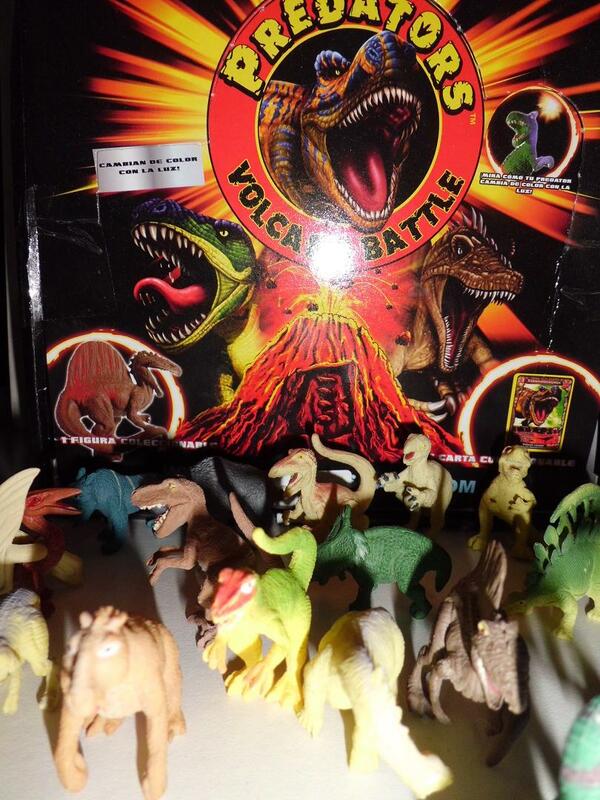 Was slummin' around at TRU and spied these gaming toys called Predasaurs with the cards and all that jazz. They only had these tins with two figures and a bunch of game cards...it was over ten bucks for it...UGH! Basically tiny little dinosaur monsters with weapons. I'm assuming we'll see smaller packs some day. Neat, but as usual, expensive. If they were just figures and not a game too, I'd bite. Anyone else see these or have 'em? Opinions? Reviews? Did they have the playsets? Looks like they are available in the UK. The playsets are kind of cheesy looking but really cool at the same time. I'm a sucker for playsets. Edited by Strontium Dog, 27 July 2012 - 07:51 AM. Interests:Transformers, G.I.Joe, Star Wars, Battle Beasts, and Gormiti. I think the tin has 2 Predasaurs plus a exclusive bonus Predasaur, plus three trading cards and the tin. This week Sunday 8/12/12-8/16/12 Toys R Us has a coupon on their main site good for $5 off any purchase, that would bring one tin down to $5.99 from $10.99. Worth checking out. I haven't seen these at any TRU. Where are you? Thanks for the heads up on the coupon! Edited by seekingxar, 14 August 2012 - 09:57 PM. I live in the east suburbs of Cleveland Ohio. I live in Columbus, and have never seen anything of these in TRU down here. They have them here in CA...you get 3 figures for $10.99...I used the $5 coupon on something else or I would have picked these up. I think they are pretty cool. I'm hoping we see the single packs soon. I saw two packs for $5.99 at Toys R Us yesterday. Man I can't wait to buy these guys. Are the single packs carded or foil-bagged? Maybe I saw the 2 pack? I didn't grab one yet, was going to go back and get one. It was blind foil-bagged. The display had one of the figures in it and I have to say I'm impressed with the details. The eyes stand out on these guys and the teeth are over the top but cool. Picked up the single packs. Comes with a card for $2.99 at TRU. They were at the front with the card packs. I really like the details and color on these guys, the teeth are almost like the glow in the dark Dracula teeth that you can get during Halloween. The eyes are cool too. They don't glow as good as I would want but still cool figures. I picked up a gob of these for my runt and myself, this past weekend. I was planning on writing a full review on them, for my blog, later this week. I got 7 of them... Including the big mamoocher, Vullturex, or whatever his name is. Sucker is heavy, for a 2" figure. 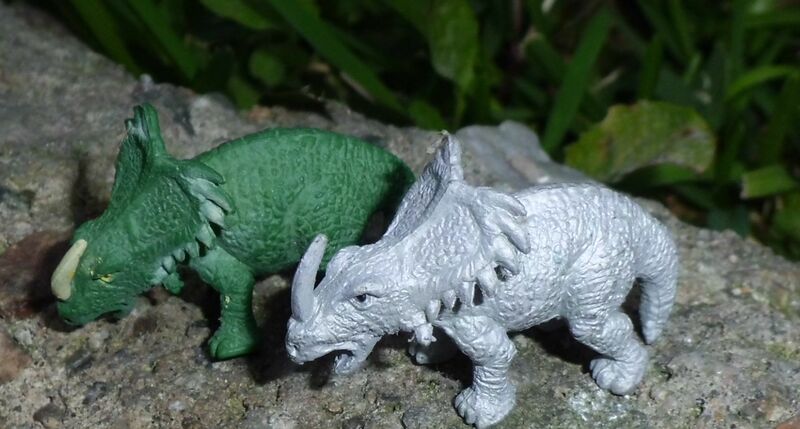 I am a fan, and hope these do well enough that Irwin brings over the Insect/Dino fusion wave over. Crap. I'm a sucker for dinosaurs but I can't really afford to get into another toy line at this point. I have a couple Toys R Us stores within 10 minutes of my house... maybe I'll go grab just a couple. For now. They have them at Target, too, also at $2.99. Interests:Orange soda, Fallout 3, Vampires, Dinosaurs, Meat!, toys (obviously), My dog: Nebuchadnezzar, My Hubby: Mike, Ichumon.com, Industrial music, Dancing, Endless Ocean, Taeyang dolls, BJD's, Pokemon, Digimon, Sharks, and so much more. Oh damn, more dinosaurs well there goes my wallet. Does anyone know if the tin has randomized singles or is it a particular 3 dinos? Always hunting dinosaurs of many types, and anything cute. Don't worry, I have a warped sense of what's "cute". still I have the hope that comes to peru. sold in peru volcano Predators battle 24 figures. You get 2 single (random) packs and 1 dinosaur that comes in every tin with special weapons. I haven't seen the tins here. Scratch that, the tins and 2-packs are here. Also, I have an extra Vulltarex, if anybody is interested. Saw these today at Target and TRU for the first time. I had to really force myself to not buy any. I had the whole box of blind packs in my hand, and put em back. Just don't need to get into anymore lines right now. Anyone have a good idea of a box breakdown? I might relent if I find another fresh box if the pack out is 1 of each figure per box. Could get a whole set. I just hate feeling up blind bags to find figs I want. Any solid picture reviews for these around? $3 bucks is a tad steep per fig really. I'm putting a review up on my blog, tomorrow, with size comparisons, and all. Review is up now, at ye old Ironhaus Pro Blog. Edited by ironmask, 01 September 2012 - 06:00 PM. Cool write up, I agree these are worth it for the price. Guessing the chase figure isn't that hard to find since you have an extra already? Maybe easy to find because of the size?